Michael Bisping was one win away from earning a shot at Anderson Silva’s UFC middleweight crown. Instead, Vitor Belfort (Pictured) decided to play spoiler and posted a TKO win over “The Count” on Saturday night in Brazil. Naturally, after foiling Bisping’s plans, Belfort requested a title shot since he beat the man who was supposed to get next dibs. However, “The Phenom” didn’t want another crack at Silva’s 185-pound belt, he pleaded with UFC co-owners Dana White and Lorenzo Fertitta for a rematch with reigning light heavyweight king Jon Jones. Jones is slated to defend his throne against Chael Sonnen at UFC 159, but much like the rest of the MMA world, Belfort doesn’t believe Sonnen’s résumé warrants a scrap with Jones. 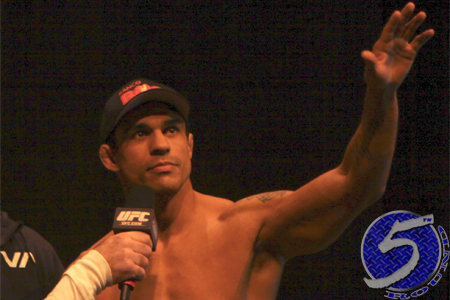 “I want to get the belt,” Belfort stated during his in-Octagon post-fight interview. “Take that punk Chael Sonnen … get him out. Dana, Lorenzo, kick him out. Let me fight Jon Jones. I need that rematch. Take that clown away. Go home. Jones and Sonnen just finished serving as opposing coaches on “The Ultimate Fighter 17,” so unless Uncle Chael suffers an injury, the UFC won’t replace him since the show will offer three months of hype for their April 27th tango. Prior to beating Bisping, Belfort was submitted by Jones at UFC 152. Although, prior to tapping to “Bones,” he came within inches of subbing Jones himself. Belfort has won eight of his last 10 bouts. The 35-year-old’s lone blemishes during his current run came against Silva and Jones, arguably the two baddest men walking the face of the earth.